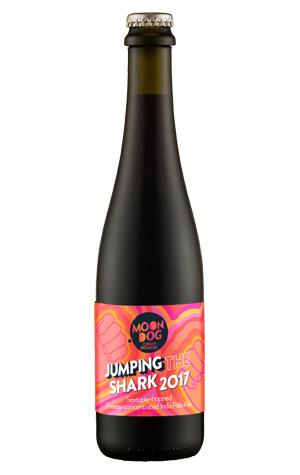 Moon Dog set the bar high with its first Jumping The Shark release. Announced as the biggest, most over-the-top beer they could conceive, it was a huge imperial stout brewed with an insane amount of stupidly expensive truffles. And it lived up to the hype, even snaffling gold at the Australian International Beer Awards. Its follow up didn't do it for us (although, with a few years on it, we'd be willing to give the saffron'd beast another go and see if time has mellowed its aggressive nature) but 2015 was a return to form in the shape of a barrel aged rye imperial stout weighing in at a stonking 18.4 percent ABV. And now number four is upon us. It's a beer in which the process tells much of the story. It started out as a big IPA, was hopped at pretty much every stage possible from mash through to post-fermentation. And that was just the start. The beer was sent offsite to be freeze concentrated to up its potency then returned to the brewery for a final dry-hopping. In all, 20 hop varieties were used and it ended up at 14.4 percent ABV. So, in terms of jumping the shark, it ticks the boxes. And...? It sticks its landing too. Sure, it's big, with some fruity, sweet alcohol elements and an ability to warm akin to wrapping your head in a thneed and popping it in a foot spa but, for all its booze, it's not hot per se. There's dank, resinous hops on the nose and plenty of spicy and tropical hop character amid the ample sweetness too. The label recommends drinking now (as it's hoppy) or later ("I age well too"); go for the former.